On Thursday, Facebook announced a new look and feel for News Feed. Reactions ranged from "about time," to "I hate Facebook, they're always changing things." I bet you can guess which type of person said each statement. Though, those who had negative thoughts, in fact, had not visited http://www.facebook.com/about/newsfeed to see what the changes would entail. Goodbye Clutter, Hello bright, beautiful stories. I couldn't agree more. In a fast-paced, visual digital world, we resonate best with images and a clean visual presentation. Page Owners: Review your cover image and profile picture to prepare for the new News Feed. When a user likes your Page, a large part of your cover image and profile picture will be see in the News Feed of that person's friends. Personal Profiles: The above for page owners applies to personal pages. When you become friends with someone on Facebook, their friends will see your profile photo and cover image - for now, it seems to be the bottom portion. It has not been mentioned whether or not cover photo dimensions will change. Watch the below video from Facebook to understand and visualize the optimizations. If you have a couple minutes after you browse your newsfeed, you can navigate to the filters and check out what you want to see. 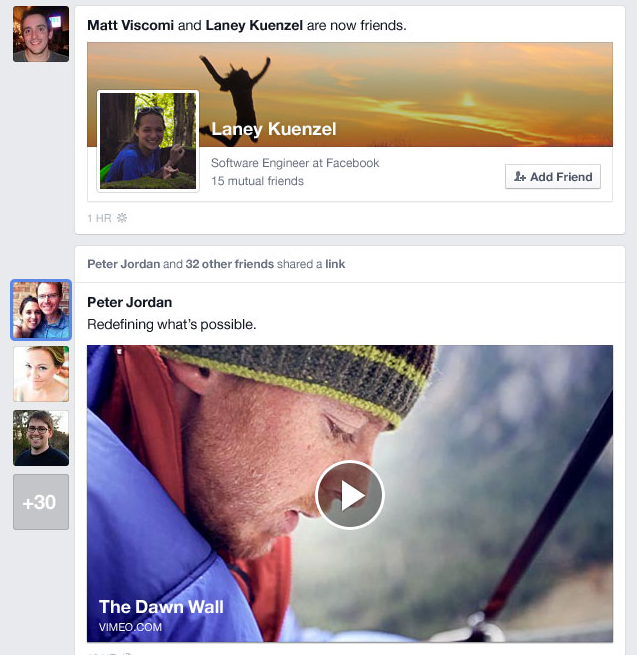 From pages your following to photos only, Facebook is letting you see what you want to see. Are you looking forward to Facebook spring cleaning your News Feed? With the filtering options, do you think it's safe to assume that Facebook ad spend will increase to get brands noticed?